Used for mounting Newall microsyn scales.List price is $74.00. NEWALL DP700 DIGITAL READOUT Lathe Packages 6" X 40", Other packages available~! DP700 Lathe. • DP700 DRO Display - 2 Axis. 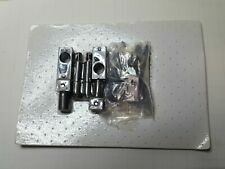 • Lathe Bracket Kit. Standard cable length is 11.5’. Extended cable lengths are available in lengths of 22’ and 32’. with 12”of travel and over. with 10” of travel and under. NEWALL SPHEROSYN 16" SCALE ONLY, WITH ALUM GUARD. Newall 12”, 16”, 18" & 20" Spherosyn Scales Only. The scales are vibration and shock resistant so you never have to worry about broken or scratched glass. and have been one of the leading Newall DRO providers in. NEWALL SPHEROSYN 12" SCALE ONLY, WITH ALUM GUARD. Newall 2-Axis DRO DP700 package for Milling machine 12"x36", brand new. · DP700 Digital Readout Display. Scales: 12"x36". Good for Milling machine 9"x42" and 9"x49" working table. Bolt Hole Circle Routine. Zero Approach Warning. RS-232 Output. Line Hole Calculator. No glass to break or scratch. Used Newall single axis digital readout. Model # DP7002110S12. Spherosyn 2G and Microsyn 2G Compatible. Machine Compatibility: Microsyn 2G; Spherosyn 2G. NEWALL 2 axis MILL DISPLAY READER HEAD ONLY # DP7002110S12. NEWALL DRO DP700 2 AXIS MILL DISPLAY DRO DISPLAY READER HEAD ONLY . Newall Microsyn 10 Reader Head Only. and have been one of the leading Newall DRO providers in. The scales are vibration and shock resistant so you never have to worry about broken or scratched glass. Newall Linear Scale ---Series - Spherosyn 2G Encoder ---Scale Type - Inductive ---Readable Length - 12"/305mm ---Overall Length - 22" ---Resolution - 5 Micron ---IP Rating - IP67 Model #S00A00305035 MSRP $400 Item is unused overstock, in good overall condition. Comes exactly as shown in pictures. Shipping Weight: 5 Lbs. Shipping Dimensions: 27” x 6” x 6” ** All Florida customers are required to pay 7% Florida sales tax Jan3118 PM2833 S-A-1. NEWALL SPHEROSYN 40" SCALE ONLY, WITH ALUM GUARD. Model # DP7003111S12. Spherosyn 2G and Microsyn 2G Compatible. Machine Compatibility: Microsyn 2G; Spherosyn 2G. NEWALL 3 axis MILL DISPLAY READER HEAD ONLY # DP7003111S12. NEWALL DRO DP700 3 AXIS MILL DISPLAY DRO DISPLAY READER HEAD ONLY . For our location google 30527 or industrialtoolandmachineworks (one word). ASK for full res photos, video of operational testing, etc. photos may have distortion, are for general scale only. Opinion of condition is only that, an opinion. Newall DP700 2 Axes DRO Display Only. DP700 is the latest in Newall's line of a powerful and intuitive DROs. The unit is housed in a rugged, ergonomically designed casting. The DRO features all of the essential functions for milling, boring, turning, grinding, and general machining operations. ASK for full res photos, video of operational testing, etc. photos may have distortion, are for general scale only. Opinion of condition is only that, an opinion. Ask for better pics if you care. Power cords plugs box covers accessories remotes wrenches chuck keys warranty cards receipts bar codes etc not included unless pictured. Part #: DP120041111S10. Fullerton, CA 92831. Orders under 150 lbs. Orders above 150 lbs. Spherosyn LT Scale on Longitudinal Axis. Spherosyn or Microsyn LT Scale for Cross Slide (dependant on option selected). Spherosyn cross slide scale will include LBK01-M. Overall length of Spherosyn scales is travel 10". Newall DRO 9 Pin to 7 Pin Adapter Cable. Orders under 150 lbs. Orders above 150 lbs. Part #:307-80980. These are the Latest and greatest DRO's on the Market! or let us know your machine model that we may help you. 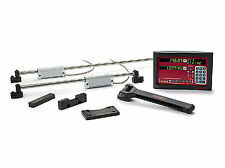 No other linear encoder matches the durability and reliability of Newall's reader heads and scales. Spherosyn 2G. Spherosyn™ technology = 1000m/s2 (100g). Spherosyn™ technology = 300m/s2 (30g). Certicates of Accuracy are included with all Newall scales. The DP700 is available in an attractive yet tough die cast housing, and a simple to install, panel mountable chassis. Designed with ease of use in mind, the new DP700 DRO is not only one of Newall`s most powerful readouts, but is also it`s most user friendly. Newall 3x Digital Read Out DRO- DP500 12" x 30" x 6" w/ Quill for mill DP500M1230M06A. Newall DP500 Flyer. Newall DP500 vs. DP700 Comparison Chart. Complete DRO System with 12" x 30" x 6" for ACER, Bridgeport, and most Taiwanese import mills. Newall DP500 Mill DRO kits set the standard for reliability, value, and ease of use. Newall DP500 Mill Digital Readout Kits Include Spherosyn/Microsyn LT scales are only compatible with Newall's DP500 display. Newall DP500 Flyer. Newall DP500 vs. DP700 Comparison Chart. Complete DRO System with 12" x 36" for ACER, Bridgeport, and most Taiwanese import mills. Other sizes avalailable. Part #: DP500M1236N00A. Newall Spherosyn 2G Encoder ---Linear Scale for Newall DRO Systems ---12"/305mm Readable Length ---5 Micron Resolution Model #SLT030500 MSRP $400 Item is unused overstock, in good overall condition. Comes exactly as shown in pictures. Shipping Weight: 5 Lbs. Shipping Dimensions: 26” x 5” x 5” ** All Florida customers are required to pay 7% Florida sales tax Mar2918 PM3119 P 36 E.
Newall DP700 Digital Readout Display - 3 Axes. Digital Readout Systems: DP700 Digital Readout. DP700 Digital Readout. DP700 DRO Data Sheet (pdf). DP700 Features Include TheDP700 is the latest in Newall's line of a powerful and intuative DROs. ELAD0001 (US Part#). Orders under 150 lbs. Orders above 150 lbs. 2320 E Valencia Dr. Fullerton Office. Part #: S2G00009D035. Orders under 150 lbs. Orders above 150 lbs. Other sizes avalailable. Piscataway Office. Fullerton, CA 92831. 2320 E Valencia Dr. Fullerton Office. NEWALL DP700 Reader Head has a Full One Year warranty. DP700 DRO designed and engineered to provide you with maximum precision readings PLUS daily usage ergonomic operator benefits. All our DRO products are Engineered to perform to the Highest Industry Standards, being designed with rugged die cast chassis and wipe-clean front panels. TheDP700 is the latest in Newall's line of a powerful and intuative DROs. The unit is housed in a rugged, ergonomically designed casting. The DRO features all of the essential functions for milling, boring, turning, grinding, and general machining operations. Newall 3 Axis Digital Readout DRO Display Model: DP700 Part No: DP7003111S10 Adjustable Milling Mount Mount Fulling extended is 24 inches long. And, there are no glass scales. Get the most out of your mill or lathe with a Newall DRO! Axis vectoring/summing. Arc contouring. RS232 output. Machine Compatibility Microsyn 2G; Spherosyn 2G. Number of Axes 2. Scale Type Electromagnetic. 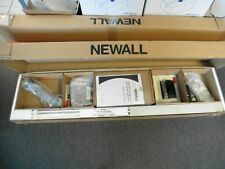 Newall Scale SS101600 w/Reader Head S2G00009D035. Condition is New. 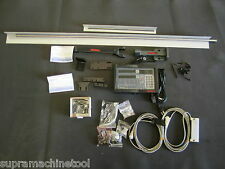 Newall Digital Read Out DRO for Lathe Package 10" x 80"
Newall DP700 2-Axis DRO Display. NEED SCALES TO GO ALONG WITH THIS?. Model # DP7001100S12. Spherosyn 2G and Microsyn 2G Compatible. Machine Compatibility: Microsyn 2G; Spherosyn 2G. 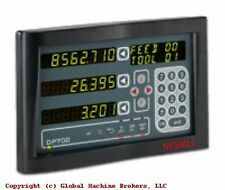 NEWALL 3 axis MILL DISPLAY READER HEAD ONLY # DP7001100S12. NEWALL DRO DP700 1 AXIS MILL DISPLAY DRO DISPLAY READER HEAD ONLY . Other sizes avalailable. Orders under 150 lbs. Orders above 150 lbs. 2320 E Valencia Dr. Fullerton Office. Piscataway, NJ 08854. 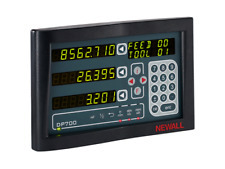 Newall DP700 3 Axes DRO Display Only. DP700 is the latest in Newall's line of a powerful and intuitive DROs. The unit is housed in a rugged, ergonomically designed casting. The DRO features all of the essential functions for milling, boring, turning, grinding, and general machining operations. Newall Digital Read Out DRO for Lathe Package 14" x 120"